Home » RESOURCES » Are you an audio detective? Are you an audio detective? In my opinion, to play is a valid tool to implement a teaching that is both effective and capable of preserving the objectives a strong pedagogy. An opinion far from the original if contextualized in that age school that reaches the end of primary school. If you proceed further, including the secondary school of first and second degree, the question turns out to be quite different. In fact, there seems to be a kind of inverse relationship, that to the aging of a kid corresponds a gradual disappearance, until the complete elimination, of the processes of playful within the teaching. This process, which for other disciplines might seem – but it is not – indeed inevitable, interesting also the music, that has many useful features to facilitate learning through play. Already in middle school, at least in Italy, the music is presented as something terribly boring and extremely far from the rich range of emotions that normally is capable of arousing. Even the computer, instrument so loved as hated, can contribute today to recover for music that playful vitality that in the past has already known, through examples such as the influential Musikalisches Würfelspiel by Mozart. The computer is placed as a tool capable of promoting a new energy to the teaching of music, and perhaps beyond. Phonopath, the project presented here, is only one of the cases in which you can see to combine music, gaming and computer science. Phonopath is a project of Kevin Regamey involving a particularly large group of collaborators. It is a work far from new, since it is already in circulation since 2012, but the intention of this article is to propose a possible application of this educational game. 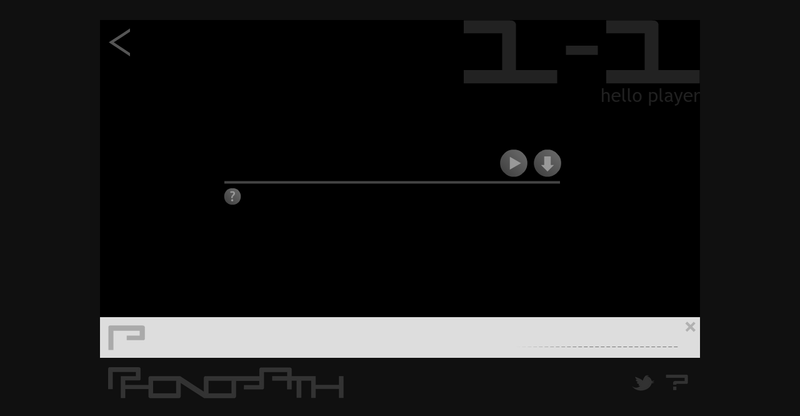 The initial screen of Phonopath. Click on the boy’s body, listen to and download the first audio file. Open it with an audio editor and decrypts the message to find out the password. 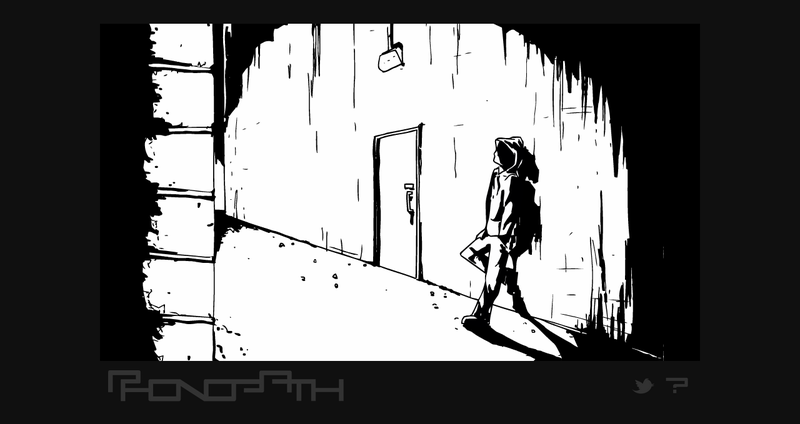 Indeed Phonopath is primarily a music game, which aims to explore the extent to which it is possible to structure a game basing it on the use of sound samples. We are facing a puzzle made of mysteries to unravel, conversations to decipher, but above all to listen to. Phonopath is structured as sound pictures and the transition from one to another can only be done through the insertion of a password, the investigator must identify sound within the sound sample provided in each stage. In that way you can get access to the next stage? Implementing various strategies of audio manipulation, such as speeding up or slowing down playback, listening to the files in reverse or inverting the signal and so on. To play you need to download the audio sample and have a good audio editor, maybe someone like Audacity, free and open source, which you can find on musicainformatica following this link. After trying to play the first few pictures, I realized that I could use Phonopath to create an educational apporach useful to encourage the learning of a basic software which can be an audio editor. I thought I would try to apply this idea by proposing this approach play to my student percussion, with no particular expertise in using Audacity. Over three lessons we tried to play the various stages as suggested by Phonopath, which require the user to explore the audio editor used to locate the function that allows the correct handling of the file, so you can locate the password for access to the next picture. 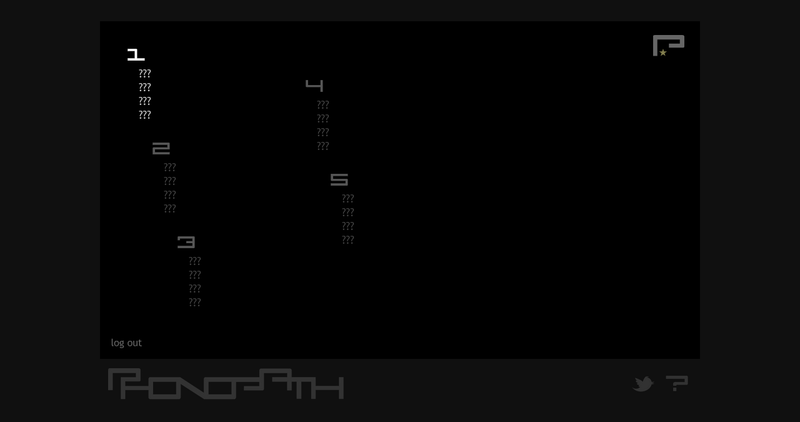 The initial menu of Phonopath which displays all five phases and their stages to play. This puzzle game has found very useful beyond expectation, favoring not only an exploration of the different features of Audacity but also stimulating critical listening and above all aware, because is during the listening that the user can define the strategy for password recovery. Phonopath is divided into five phases, each consisting of four stages. For each stage is available an audio file to listen online and to download, to be able to open it with an audio editor. In addition you can also use a hint, the property offers a suggestion, which helps to understand in what way to discover the password. Beware that sometimes the main problem is not to be able to determine which processing subject the audio files but rather be able to understand the actual word that lets you switch to the next audio file. The screen of the first part of the first phase. You can see the buttons for listening and downloading. The question mark to the left indicates the presence of a suggestion for the solution of the problem. Bottom right shows the string where you enter the correct password. Well, at this point you just need to play … and learn. To get started click this link that takes you to the official website. You? How about Phonopath? Have you tried? If you have some experience to tell or you simply want to leave a comment, it will be a great pleasure for me to read you.